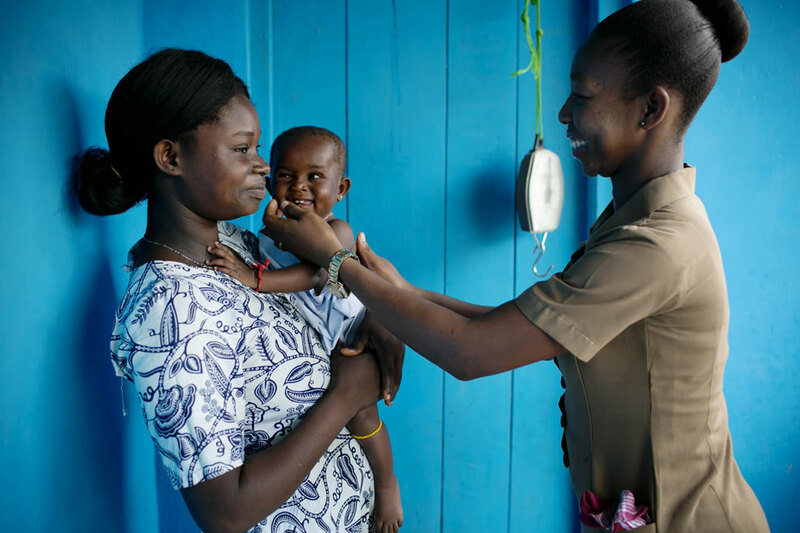 Last month marked an important step forward in sub-Saharan Africa's move toward strategic, sustainable, and country-led financing for family planning. Stakeholders from national governments, civil society, the private sector, USAID, and other development partner organizations gathered at a week-long meeting in Accra, Ghana to share country experiences and explore cutting-edge approaches and tools. They took home with them clearly-articulated action plans on how to advance family planning financing in their countries, plans they will share with their Family Planning 2020 (FP2020) focal points. The Attaining Sustainable Financing for Family Planning in Sub-Saharan Africa meeting, held January 15−19 with 150 participants from 13 sub-Saharan African countries, was sponsored by USAID, organized by the USAID-funded Health Policy Plus (HP+) project, and further supported by a range of USAID projects, including the HFG Project, PACE, SHOPS Plus, SIFPO2/MSI, and SIFPO2/PSI. At issue was how countries, particularly low- and middle-income countries, can overcome mounting constraints to finance primary healthcare, especially family planning. The case for investing in family planning is strong. There's a high return on investment. It can cut costs across all sectors—freeing up scarce resources for health, education, infrastructure—and spur economic growth. It can help countries make progress toward ambitious global targets related to family planning and universal health coverage. Yet, faced with limited domestic resources and unstable external funding, there is a growing need to strategize on how to sustainably finance family planning. This is particularly true in sub-Saharan Africa where the unmet need for modern family planning methods and fertility are particularly high. 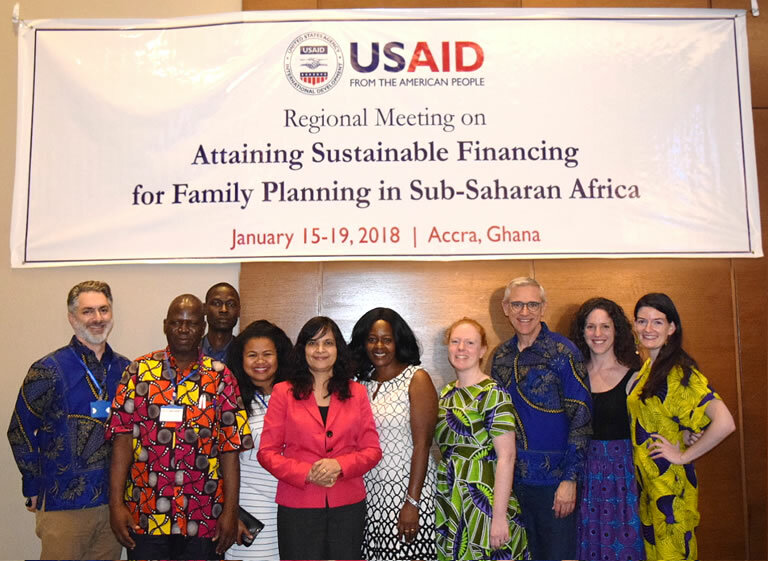 Over the course of the five-day meeting, participants tackled this need, sharing challenges, experiences, and best practices in family planning financing. Technical advisors from HP+ contributed to discussions on how to quantify need, mobilize resources, and engage the private sector. Before a country can adequately fund family planning, the government needs to be able to quantify its resource needs and understand how family planning, family planning financing, and health financing relate. That was the argument made by Cathy Barker Cantelmo, HP+ senior health financing associate and Megan Ginivan, HP+ health systems associate, who introduced the S-curve and health financing maturity typologies, making the link between expanding access and uptake of family planning and a country's ability to finance health. Barker Cantelmo also previewed a newly-developed USAID/HP+ Family Planning Financing Roadmap, a website being released later this month that will provide resources on, and tailored recommendations for, family planning financing through the use of an interactive module. HP+'s West Africa Regional Director, Modibo Maiga, provided an overview of costed implementation plans for family planning and their relevance to health financing, echoed by Dr. Haingonirina Eulalie Ramananjanahary, the division head for family planning at the Ministry of Health in Madagascar, who shared her experience working with HP+ to develop Madagascar's first costed implementation plan. Sufficiently and efficiently funding family planning requires thoughtful planning for how countries can transition from donor to domestic funding and strategically purchase health services. HP+'s Deputy Director for Family Planning/Reproductive Health, Jay Gribble, presented a case study from Guatemala that highlighted the steps the government took to introduce an alcohol tax to support sustainable funding for contraceptives and how it's helping Guatemala transition from donor to domestic funding. HP+'s Project Director, Suneeta Sharma, discussed how socio-cultural barriers and unintentional outcomes stemming from incentives to providers and patients can affect family planning access and should be considered when purchasing family-planning services and to ensure voluntary, rights-based family planning. To widen the scope of family-planning financing, Palladium's Director of Health Markets and Behaviour Change, Stephen Rahaim; Head of the Reproductive Health Unit for Uganda's Ministry of Health, Dr. Placid Mihayo; and Senior Social Marketing Advisor at the Uganda Health Marketing Group, Robert Kigula shared how the public sector could better engage with the private sector in a mutually-beneficial relationship to support family planning financing. Highlighting experiences from Uganda, the trio presented on the benefits of a total market approach—one that promotes multisector collaboration and partnership and uses market data to improve the use of resources and the equitable reach of quality services. As part of the presentation, Rahaim highlighted a market projection model and political economy analysis that HP+ has been supporting to inform the application of a total market approach in Uganda. At the end of the five days, country teams left with clear lessons and examples of how family planning financing could be strengthened. Perhaps more importantly, they left with concrete action plans to advance family planning financing in their country contexts and an expanded view of how family planning financing can be defined. Elise Lang, HP+ Senior Health Financing Associate, reflected, "Family planning financing must go beyond developing government budget line items towards integrated, sustainable efforts. This is best done in the context of universal health coverage, through concepts like strategic purchasing and increased private sector engagement." See our conference highlight for more information on the Attaining Sustainable Financing for Family Planning in Sub-Saharan Africa meeting and to download materials. Sponsored by USAID and organized by HP+, the Attaining Sustainable Financing for Family Planning in Sub-Saharan Africa meeting was supported by a range of USAID projects, including the Health Finance and Governance (HFG) project; the Policy, Advocacy, and Communication Enhanced for Population and Reproductive Health (PACE) project; Sustaining Health Outcomes through the Private Sector (SHOPS) Plus; and the Support for International Family Planning and Health Organizations 2 (SIFPO2) program, with Marie Stopes International (SIFPO2/MSI) and Population Services International (SIFPO2/PSI). HP+ in Accra: Stephen Rahaim, Birama Djan Diakite, Kouame Konan, Onisoa Rindra Ralidera, Suneeta Sharma, Olive Mtema, Cathy Barker Cantelmo, Jay Gribble, Megan Ginivan, Elise Lang, Modibo Maiga (not pictured), and Angela Ahiabenu (not pictured).